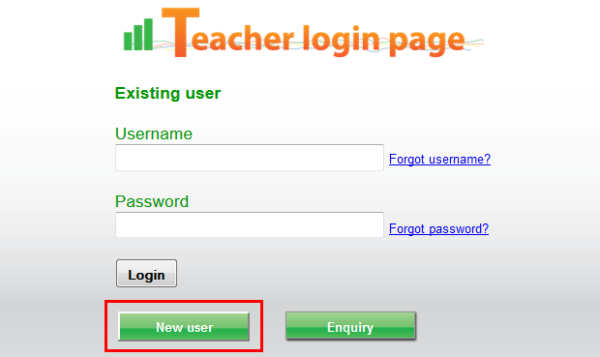 Information about how to apply for user account and how to log into the teacher interface. 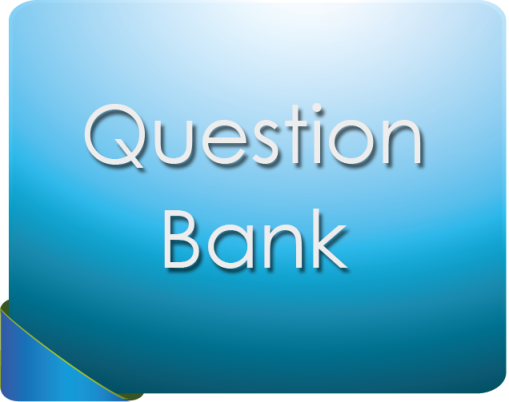 Teachers can pre-install questions and arrange them into quizzes in the question bank for convenient retrieval in the classroom. 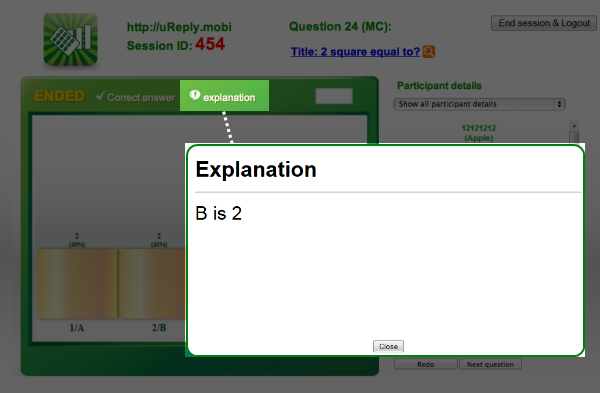 Doing Q&A exercise in the class using uReply is done through starting a 'session'. 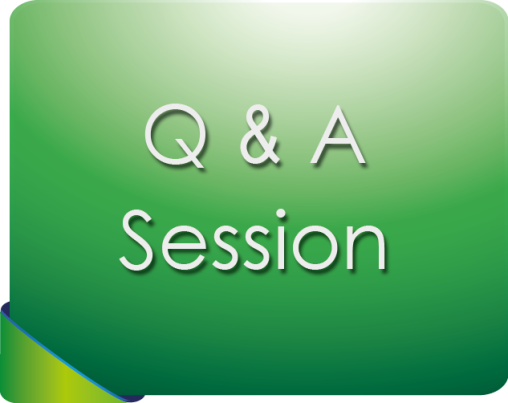 The number of questions in a session is not limited. Users can retrieve activity reports at any time after the session is closed. 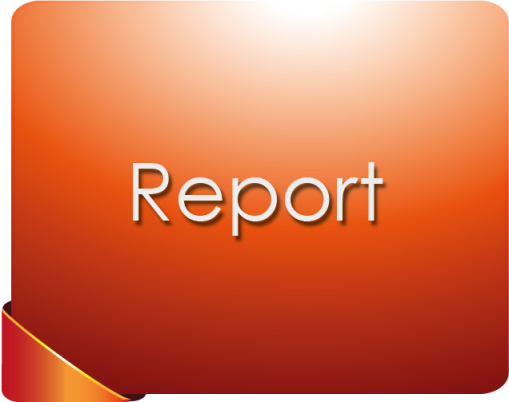 The report area of the system has records of all the previous sessions of users. The teacher gets access to the system on a web browser (http://teacher.ureply.mobi). Registration can be done through clicking the ‘new user’ button on the system home. Teachers are advised to complete the registration before attending class and keep/ remember the id and password well for long-term use. Please note that registration of uReply version 2.0 is open for CUHK users only. We will process registration made by CUHK teachers (with valid CUHK email addresses). The teacher gets access to the system on a web browser (http://teacher.ureply.mobi). Teacher then keys in the previously-acquired id and password to log into the system. 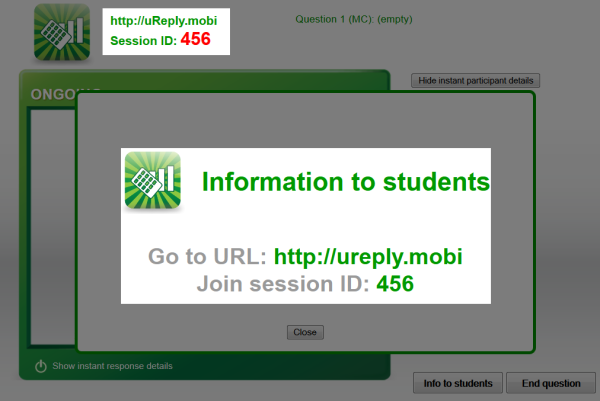 Students go to http://ureply.mobi on their mobile devices. For iPhone and Android phone users, there are dedicated apps created, called ‘uReply’, for the purpose. Downloading and installing the apps may take time and so teachers may ask students to install the apps before attending class. Students DO NOT need to register. Click here to view the apps on iTunes Store. Before making any questions, you need to create a quiz (folder) to house the questions first. There are no limits to the number of quizzes you create. Also, copying question items from one quiz to another is easy. Inside a quiz, you can create your questions one by one. You can have both MC-type and text-type questions in one quiz. For the MC questions, you can preset the correct choice as well as type in feedback you would like to display after the question is completed in the class. 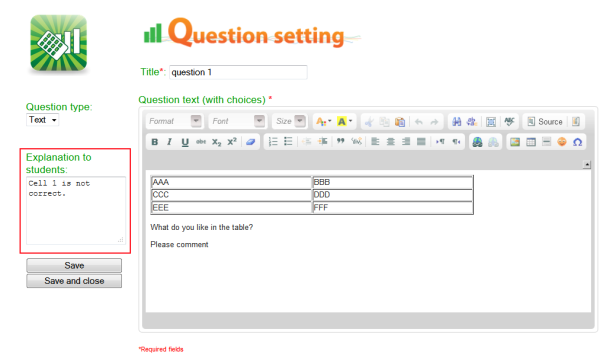 For the text questions, typing in feedback to students is also possible. By default, items in a quiz are arranged according to their time of creation (older items are the earlier items on the quiz). You can overrule this order by explicitly indicating the ‘order priority’ of each of the questions in a quiz. Item with a smaller priority number goes to the top of the quiz. These numbers do not need to be continuous; there can be missing values in between. 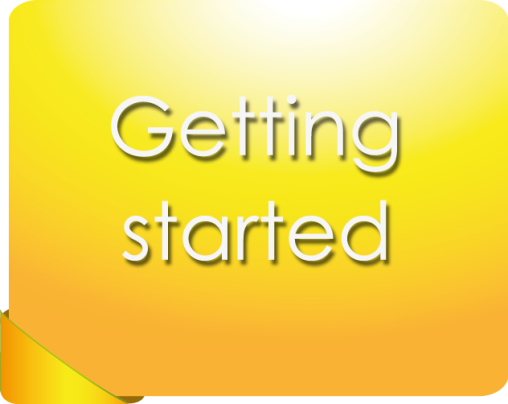 Teachers click ‘Start new session’ to start a session. A ‘session id’ will show up on the screen. As there may be multiple ongoing sessions in other classrooms, the session id serves to distinguish the communications in your classroom from the others. Please make sure students key in the ‘session id’ correctly to get into the right place. 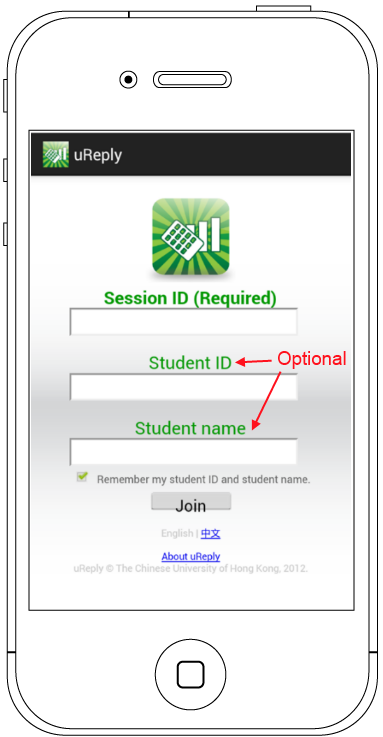 In Version 2.0, however, teachers have the option of reusing the previous session id. This function is particularly useful if the teacher has closed the session by accident and wants to relieve students from the trouble of logging out and keying in a new session id. Students are asked three pieces of information on the very first page of the system: ‘session id’, ‘student id’ and ‘student name’. ‘Session id’ is obligatory and their input should match the session id as indicated on the teacher side. ‘Student id’ and ‘name’ are optional. If teachers want anonymity, they may ask students to leave them blank. On the contrary, if teachers want to associate replies with individual students, they may want to verbally require/ encourage students to key in their CUHK student id and their names on the login page. Teachers choose the question type (either ‘MC’ or ‘Short question’). 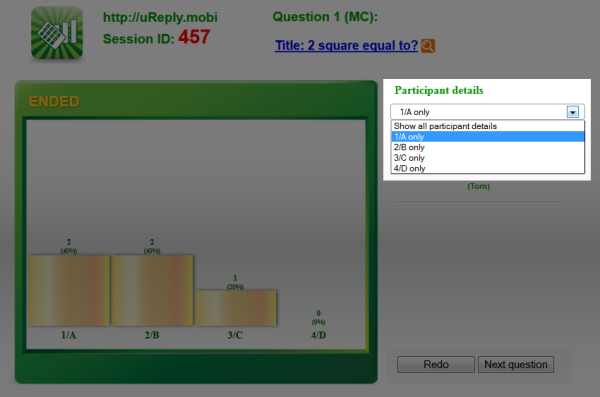 If it is an MC question, teachers need to specify the number of choices too. Teachers may also want to type (or copy-and-paste) the question text (include the choices as well if it is an MC) onto the system but this is optional particularly if students know about the information already through other means, such as questions explained verbally, questions printed on worksheets/ books, questions on PowerPoint slides being shown on another screen in a two-projector classroom, or questions on a smaller window sharing the same computer screen with the system. The presence of question text, however, will help teachers understand the activity reports particularly when they retrieve and read these reports a long time after. Click ‘start’ to begin accepting student responses. In Version 2.0, teachers can run a session using questions they have already pre-installed in their personal question bank. 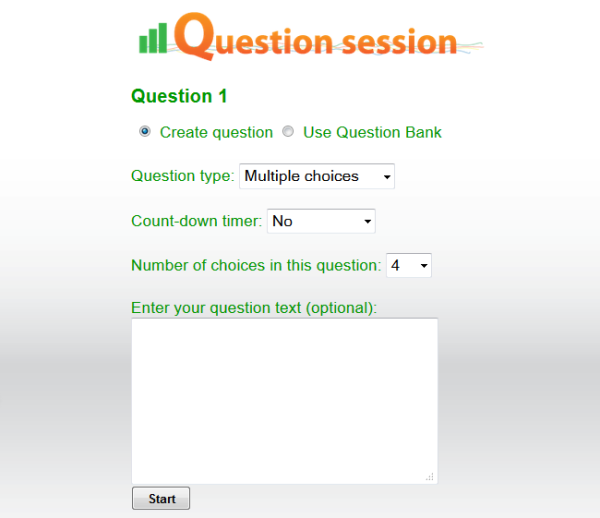 Simply choose the question bank tab, find the quiz you have created and then pick the question item you would like to open. 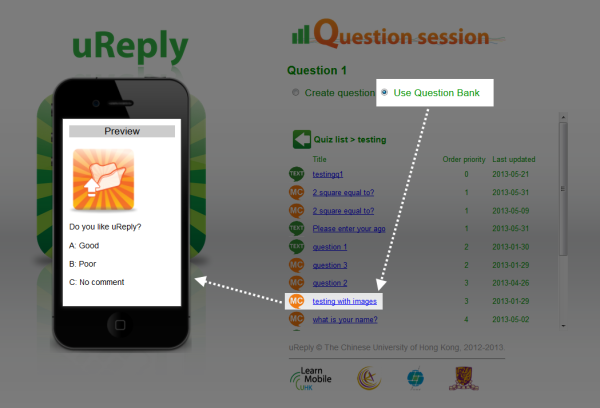 Students are able to read the question text (if available) on the mobile devices when the question is active. Students pick and choose a choice, or input text as response depending on the question type. Students may re-select or re-type as many times as they like before the question ends. The system records the last entry of the students’ input as their final answers. The system shows the list of the students who have joined the session by default. 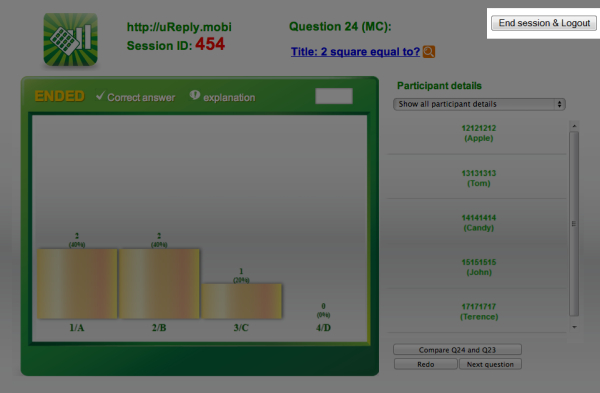 There are also indications showing who have already submitted an answer to the question. 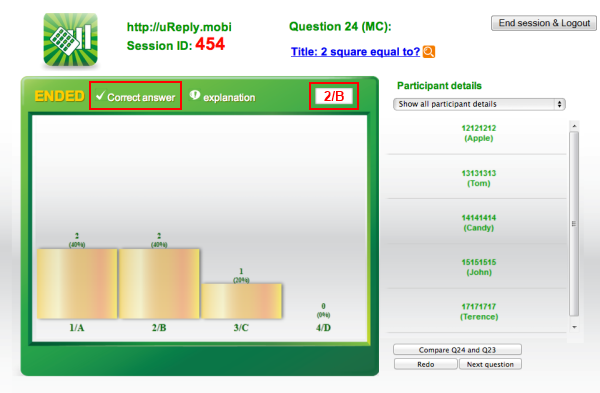 The ratio of the number of students responded / the number of total students in the session is also available at the bottom right corner of the screen as a quick way for teachers to judge the progress of the activity. Teacher may choose to hide the list from the display by clicking the ‘show/hide’ button. MC responses are displayed graphically while responses to a short question are listed in table format. By default, live responses are shown in the result display area even when the questioning is in progress, but teacher may want to turn off this live display by clicking the ‘show/hide’ checkbox in the display area. Teachers end the question by clicking ‘End question’. 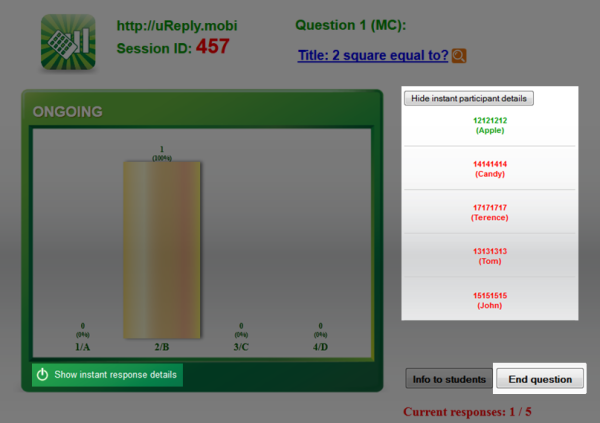 After that, no more new responses will be recorded and students can no longer change what they have already submitted. When a question is ended, teacher will find that they are able to get even more information in the display area. For example, if students logged in with their names and/or student ids, teachers can find out who picked a certain choice in an MC question by clicking the corresponding bar on the graph. They can also relate textual replies to the students who made them. 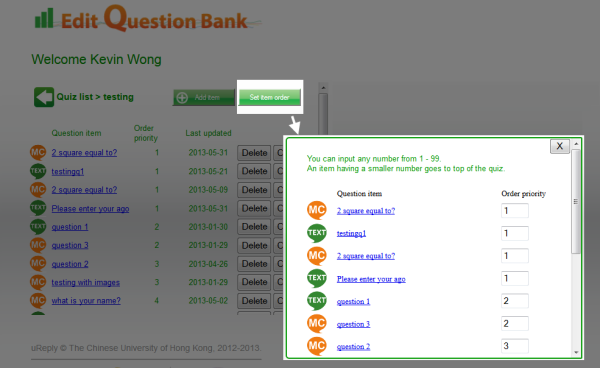 A ‘show feedback‘ button is visible when a question item has some preloaded feedback and when the question is ended. 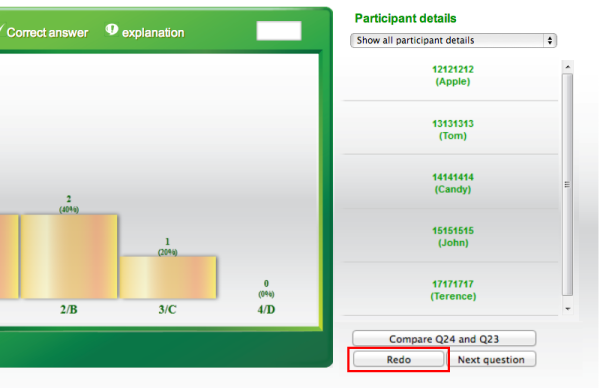 Then the teacher can choose to display the feedback by clicking the ‘show feedback’ button. 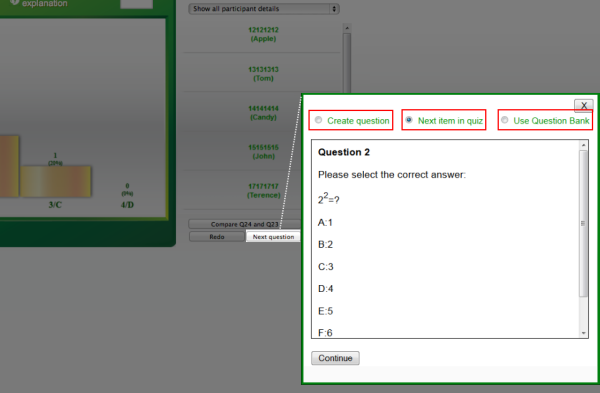 A ‘show correct answer‘ button is visible when a question item has a predefined answer and when the question is ended. 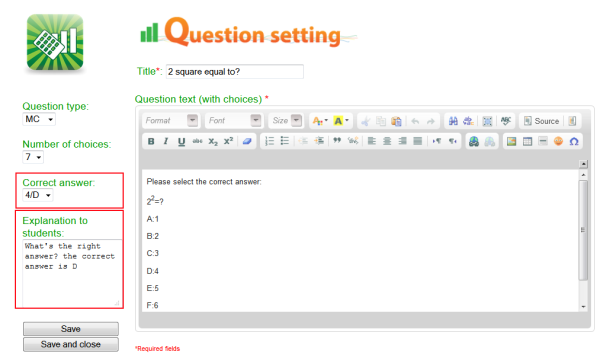 The teacher can choose to display the correct answer by clicking the ‘show correct answer’ button. ‘Redo’ is a new function in Version 2.0 to let teachers easily redo a previous item (likely after further explanation or discussion) no matter it is created on-the-fly or it is an item in the question bank. 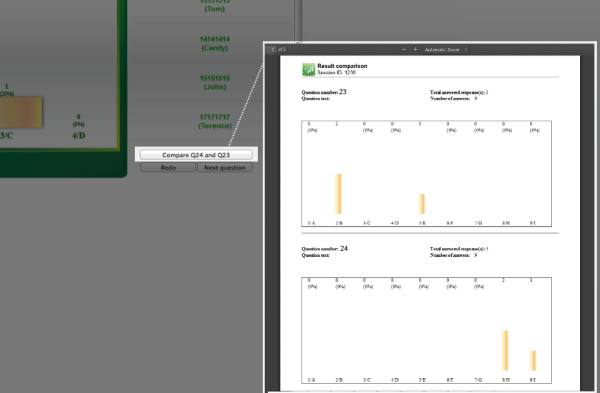 Moreover, the results of the question in two rounds can be shown side-by-side for contrast. 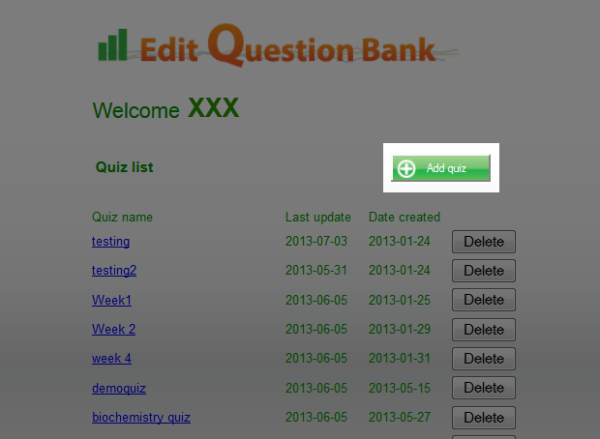 If the teacher has been using question bank items, the ‘next question in quiz’ button lets the teacher quickly jump to the next question in the quiz. Alternatively, the teacher may choose to create the next question on-the-fly. If there are no more questions to ask, the teacher may end the session by clicking ‘End session & Log out’. Ending the session makes the session id no more valid. Starting a new session by default means there will be new allocation of session id and students have to log into the system again. As noted earlier, in Version 2.0, however, teachers have the option of reusing the previous session id. This function is particularly useful if the teacher has closed the session by accident and wants to relieve students from the trouble of logging out and keying in a new session id. 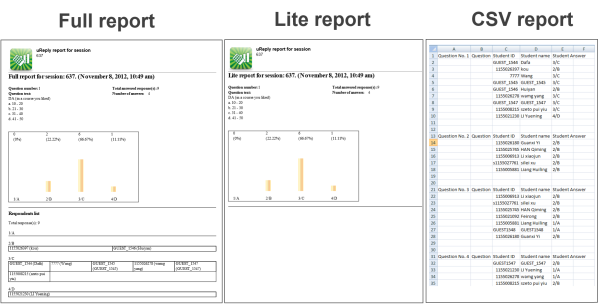 Full version reports have information of responses by individual respondents while the lite reports show only the whole-class performance. Full version reports are good for teachers who would like to take a closer look at individual performance while the lite reports can be good for teachers who would like to give students a record of how the whole class responded to questions. In other words, the brief reports are relatively safe for teachers to directly send to students as they are free of individual information. Lastly, the ‘CSV’ format provides the information in a style that can be opened in Excel. It is good for teachers who would like to do more precise analyses on students’ answers. 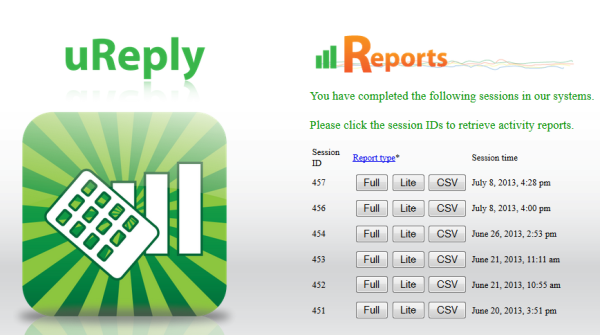 Each of the session activity reports contains information about all the questions asked in that session. If the students logged in with their names and/or student ids, teachers can find out who picked a certain choice in an MC question too. They can also relate textual replies to the students who made them. Copyright © 2012-2013 Centre for Learning Enhancement And Research, The Chinese University of Hong Kong. All rights reserved.